I've used quite a few different (somewhat affordable) wireless video transmitters, and the one that seems to be most consistent with long range has been the Connex Kits. There is a full size Connex version capable of 1,000m LOS range, and a newer Connex Mini that transmits 500m LOS range (that's still quite a distance!). 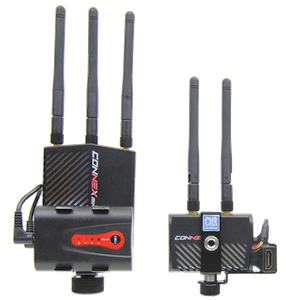 There are some short comings to the Connex system when using it for video cameras, as these kits were originally designed for Drone use streaming full 1080p up to 60fps. Some of the cons for on-camera video use are that it requires a battery, but there are no battery mounts. Also there are no standard mounts to attach to your video rigs. Finally it doesn't transmit audio (if you need this). But for distance, reliability, performance, and price the Connex kits are darn good. To make life easier, Camera Motion Research created a special frame and battery kit for us shooters. The latest mod for their Connex Mini kits is adding an SDI to HDMI converter. This allows someone like me to now use the Connex Mini kit with professional cameras that only offer SDI out, and does it in a clean, simple, and easy way. All of the new hardware is still within the custom modded frame kit, and it's all powered by a single cable (via D-tap). I'm often running Multicam Live Switching at events and one of the biggest headaches is runnning SDI Cable across the floors. It's not easy running cables and taping them down. This also prevents the cameras from being mobile. But with a wireless video kit, you can move freely around the event. With this new mod, you basically have a tiny high performing wireless HD video kit that can support both HDMI or SDI inputs. Here's a test of latency below. Keep in mind that in my latency test, the Connex Mini does not transmit audio. My audio source is coming in from another input into the ATEM Switcher. Both feeds were recorded to a Hyperdeck Mini and you can see it's just about perfect in sync. With this type of setup, that camera is now free to roam up to 1600 Feet away from the receiver, and we can still Live Switch during a Live Production. If you are working with the Connex Wireless HD Video kits, and you experience latency, that could possibly be caused by your camera's output. Some cameras will have a 3-6 frame delay and you'll notice this when connected to any monitor. I personally have moved to working with the Ursa Mini cameras for my Live Production, as this camera offers almost no delay on SDI output, and with SDI I can do long runs up to 300 feet (HDMI limit is around 12 feet). Posted in dslr video. 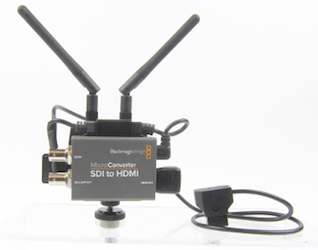 Tags: BlackMagic Design, camera motion research, CamotionLLC, connex hd transmitter, connex mini, drone connex, hdmi sdi converter on April 5, 2017 by Cheesycam. If you're looking to add a Director's monitor feed to your workflow, Camera Motion Research is offering a nice sale on their complete RTR Wireless Director's Monitor Bundle. 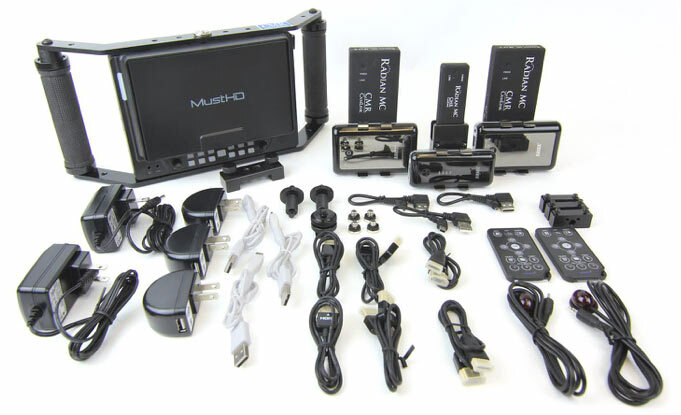 This CMR Bundle includes a 7" MustHD LCD Monitor, Monitor yoke, RM12 Wireless Video Set with 2 receivers, and the Backbones for the Radian Wireless HD Video Transmitters and Receivers. With this kit, you'll be able to stream the video feed from your camera's HDMI output to a remote LCD Monitor up to 300ft (LOS) away. Having a director's monitor available on set is one of the best tools to have when working with anyone that needs to view the videos being shot from your camera so that they can offer creative input, or at times this tool is used for someone pulling focus remotely (especially when your camera is mounted to a gimbal). You can also use this when mounting your camera at the end of a long JIB / Crane, or when you have a remote camera that needs to stream video back to a Live Switch. Tons of useful reasons to have a Wireless Video Streaming kit on hand. For more information about this current sale on the Camera Motion Research Wireless Director's Monitor Bundle (click here). Posted in dslr video. Tags: camera motion research, cmr, directors monitor, hd video, hdmi monitor, musthd, radian wireless, stream hdmi, wireless monitor on January 24, 2017 by Cheesycam. A short while back Amimon made available a Wireless HD Video Kit primarily targeted for Drone use called the Connex. The Connex kit could stream Full 1080p HD Video up to 60fps at a distance of 3300ft with incredibly low latency. 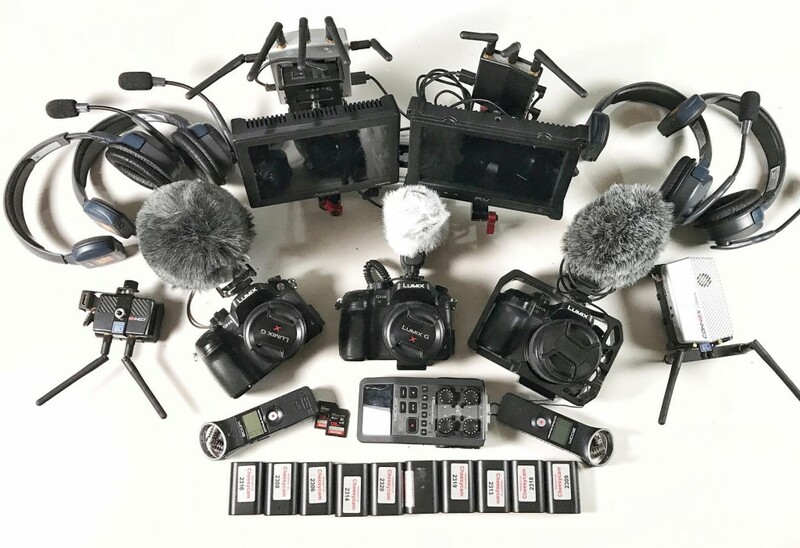 The kit, not originally designed for video shooters was quickly modified by Camera Motion Research and has since been a popular affordable choice for those looking to send wireless HD video. This year Amimon released a new kit called the Connex Mini. This system works exactly the same, except it now comes in a much smaller size, requires less power, and does not include a cooling fan like the original Connex (completely silent). 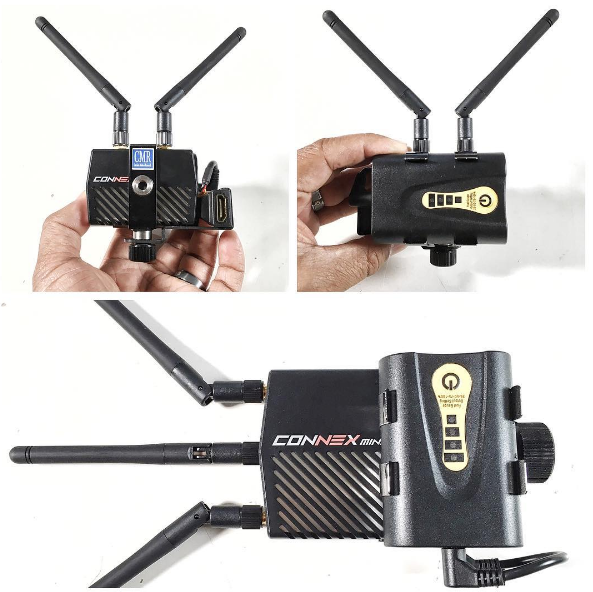 Once again Camera Motion Research has created special accessories for the Connex Mini to allow video shooters to use with simple plug and play. Keep in mind the Connex Mini does not stream audio, but the main stand out features for the Connex Mini are it's compact size, stream long distances up to 1600 ft, almost zero latency, and more importantly the ability Multicast up to 4 receivers (if you're looking to expand your kit in the future). 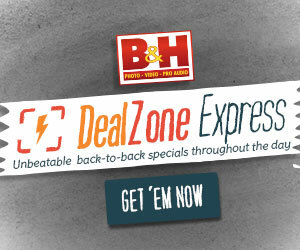 These combined features are normally only found on more expensive systems. So what other applications would need Wireless HD Video? Besides drone use, or on set sending feed to a director's monitor, this can be setup on a gimbal or Steadicam while someone else pulls focus remotely (low latency is important on this one). It can also be used on a Cable Cam setup or to send wireless video back to a Multicam Switcher during live events. 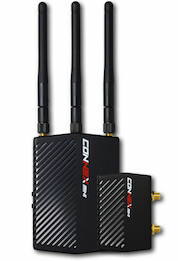 There's multiple reasons why you may one day require wireless video, and the Connex Mini is a good option to keep in your radar. You can get more information about the Connex Mini and custom accessories available from Camera Motion Research at CAMOTIONLLC.com (here). Posted in dslr video. Tags: amimom connex, camera motion research, CamotionLLC, connex mini, fpv drone, stream 1080, wireless hd video, wireless video transmitter on December 1, 2016 by Cheesycam. We take time out to chat with Rich from Camera Motion Research about the new Connex Mini Kit. The Amimon Connex Mini is a Highly Reliable transmitter and receiver kit designed to take the feed from your camera's HDMI output and send it wirelessly over 1600 Feet (500 Meters) to a receiver which can then be displayed on an HDMI monitor. These kits are high performance offering Full 1080p up to 60fps transmissions with almost no latency. 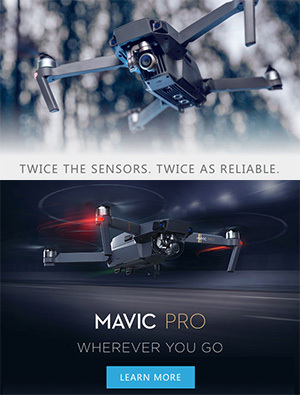 The catch is that the Connex Mini is originally designed for Drone use. This means it would normally take a bit of fumbling for you to mount to your Video Cameras along with a portable way to power the kit. 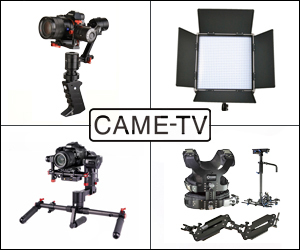 Because these systems can be more reliable than other off-the-shelf wireless video kits, Camera Motion Research has designed a custom accessory pack which includes a frame with threaded mounts for simple rigging and incorporated a lightweight portable rechargeable battery pack solution. 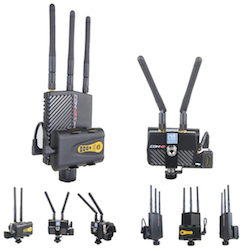 With these custom modifications, video camera operators can use attach the kits in seconds offering access to a highly reliable wireless video solution for less money. Of course the cost is reflected by the lack of audio and no SDI inputs (only HDMI) when compared to other expensive units that may offer similar range. 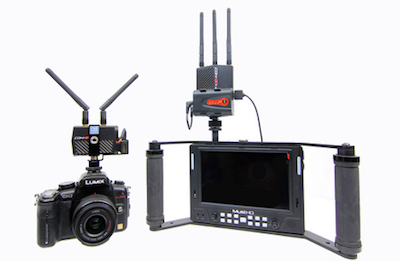 Wireless Video Kits are often used when Steadicam or Gimbal Operators have to send their camera's feed to a director's monitor, when a camera is mounted to a Cable Cam (Wire Cam), Gimbal RC Car, on a custom built Drone, etc. It can also be used for today's demand for Live Streaming videos by sending your feed back to a Multi-Cam Live Switch. 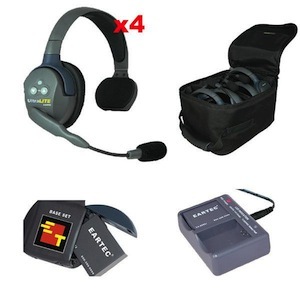 You can find the Connex Mini Wireless Video Kits and Custom Accessories at http://CamotionLLC.com (here). Posted in dslr video. Tags: amimon connex, camera motion research, Camotion, CamotionLLC, connex mini, portable battery pack, wireless video transmitter on September 27, 2016 by Cheesycam. In this interview video, Rich from Camera Motion Research demos the iFootage Minicrane M1 III. This tool-less Carbon Fiber telescoping portable Jib offers it's own panning base (no heavy duty fluid head required), quick leveling of the camera platform, and even Auto Tilt parallax-like tracking during vertical moves. 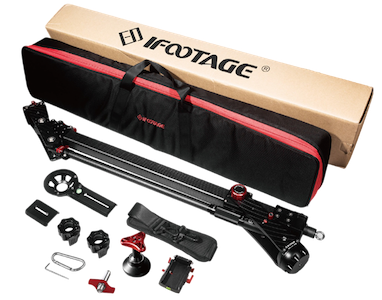 The iFootage Minicrane M1 III weighs just 8lbs, can extend to a full 85 inches, and supports up to 33 lbs camera setups. 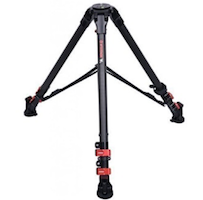 The iFootage Wild Bull T5 Tripod is a great choice for those looking for a tripod that is lightweight, compact, and has a high load capacity of 88 lbs. The T5 is anodized aluminum construction. It has a 59 in. 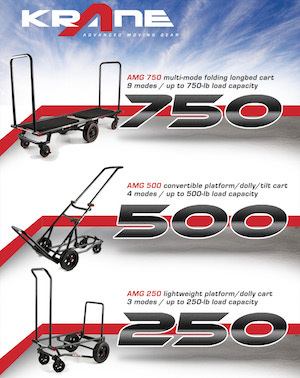 maximum height, a minimum height of 8 in., and weighs only 8.8 lb. Collapsed length is 28.3 inches. Bowl diameter is 75mm. 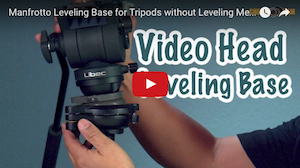 Adjustable feet spikes and feet pads allow the tripod to function in uneven terrain. The locking legs can be adjusted to any angle from 15° to 78°. The quick release locking lever design allows fast lock and release of the tripod legs with just one hand. Its spreader is easily moved from bottom to mid section. The T5 includes a padded carrying case with comfortable shoulder strap and side handle. 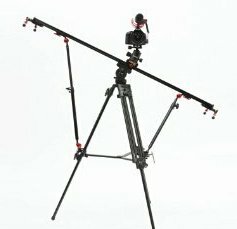 Both the iFootage Minicrane M1 III and the iFootage Wild Bull T5 Tripod are available now at the Camera Motion Research Website at http://Camotionllc.com (here). Posted in dslr video. Tags: camera motion research, CamotionLLC, ifootage crane, ifootage jib, ifootage tripod, minicrane m1 iii, nab 2016, nabshow, nabshow2016, rich, wild bull t5 tripod on June 16, 2016 by Cheesycam. 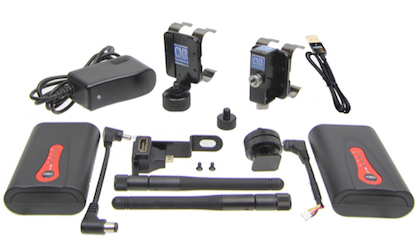 The Connex Accessory Pack by Camera Motion Research is a custom kit designed to make using your Amimon Connex simple to use for video use. Normally over $300 for this kit, they are currently offering a 25% discount on this accessory pack (found here). The kit includes a Battery Cage and Antenna Support for the Air Unit (TX), a Battery Cage for the Ground Unit (RX), Power Cables, Shoe Mount adapter with thumbscrews, thin 19 inch Flexible HDMI (A) to mini HDMI (C), two 12V rechargeable Lithium batteries, two AC battery chargers, and spare mounting screws. This kit is an add-on that modifies the Connex so that the TX and RX can be powered with their own portable battery along with simple mounting options to use with camera and remote monitor. The Connex is an extremely reliable full 1080 HD Video transmitter that can achieve 1080p up to 60fps over 1000 Meters away. The omni-directional broadcast means that it is not as sensitive to direct line of sight as other kits, and we've even used the system through obstacles (several walls) without a hiccup. If you're not familiar with this system, I have a product overview of the Connex (here). In the video below you'll see an example of @SatoStudios using the Connex with CMR Accessory Pack during a music video shoot streaming to an OSEE Monitor. The shot required the gimbal operator (Scotty) to walk backwards up a curved flight of stairs, continue down a long hallway, into a bedroom. 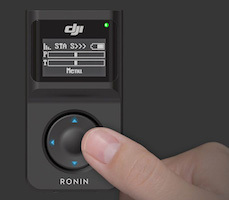 With the Connex attached to a DJI Ronin-M gimbal, the operator was free to focus on walking (making sure he doesn't trip up or fall) while Mike Sato remotely controlled Pan and Tilt camera movements using an optional DJI Ronin-M Wireless Thumb Controller from a distance. Posted in dslr video. Tags: 1080 60, amimon connex, camera motion research, CamotionLLC, cmr, connex 3000 meters, connex mini, hdmi video wireless stream, transmit hd video, wireless video on February 15, 2016 by Emm. The Amimon Connex Wireless HD Video Transmitter was designed for Professional Drone use, but with a modified kit from Camera Motion Research you can use it to transmit the HD Video from your HDMI over 3,300 feet (or 1,000 meters). The video transmits in full Uncompressed 1080p up to 60fps with what they say is zero latency. 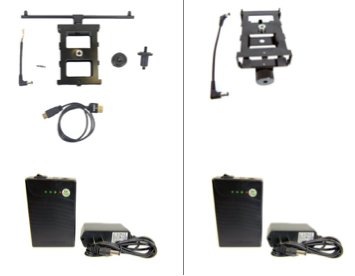 The Amimon Connex kit from CMR has been modified for ease of use with your video cameras by attaching a custom battery pack frame to both the transmitter and receiver, includes modified power cables, and also adding 1/4-20 threaded mounts for mounting to a hotshoe or rig (among other small accessories added to the kit). Even though this particular Connex kit has been modified, you can always remove the battery mount if you want to use it for your Professional Drone. For those who aren't familiar, Amimon chipsets are licensed to other big brand wireless video transmitters (i.e.Teradek), so they are proven to be reliable and robust. The value in the Connex kit specifically is that it does lack SDI inputs and does not transmit Audio. This system is for HDMI use only (but you can always add an SDI to HDMI converter). Posted in dslr video. Tags: amimon connex review, camera motion research, cmr modified connex kit, connex mini, hdmi video, transmit wireless hd video, wireless video over hdmi on January 25, 2016 by Emm.